Representing Multiple Direct Selling Companies Good Idea? The products should be non-competing. It doesn't make business sense to represent two jewelry companies or two skin care product lines. But I think some people can handle a jewelry business and a personal care products business because they are completely different and non-competing. Resist cross recruiting and showcasing both companies at the same time. I think this can compromise the seriousness of your intentions. That said, if your goal is to sell every now and then, have some fun with your friends, and your pals know your intentions then I don't think you need to worry about it. That is the beauty of the direct selling industry as it attracts all kinds of people with different goals and desires. Not everybody is in to get to the top. In fact, I have a casual friend who sells for Origami Owl Living Jewelry and she is always upfront and tells people she's only selling the products with no interest in building a team. Know your goals upfront because if your goal is to build a team with two companies, it can be difficult, and potentially costly. Direct selling business is more than selling products but mentoring your team of consultants that chose you to mentor them. I don't think it's fair to bring people into your team and not be committed to helping them succeed. On a financial level, every company requires a personal sales volume each month before you can earn from your team. This is not the same as being active. You can be active but if you don't sell x-amount a month you won't get a commission from your team. If you're building a team with two companies, be prepared to sell a lot of products to hit those requirements. Bottom line is, if you're thinking of taking on two companies, give some thought to what your immediate and long term goals are and if you're planning on building a team with both. With my experience, I'd say you would have more success with building a team with one company and perhaps your second one as a "hobby" or as a "wholesale" option. I have a long term goal with my natural products company because it is so do-able. There are no monthly auto-ships, monthly sales requirements other than for team leaders, and the products are consumable which means there are plenty of opportunities for repeat orders. If I were to take on a second company, it would be secondary and more as a "wholesale" to buy products I love at a discount. With so many wonderful direct selling companies and fabulous products, I can see the temptation of wanting to represent multiple direct selling companies but whether it's good for you as a consultant or not all depends on your goals. How about you? Do you represent more than one company? Share your story by leaving a comment below. P.S. Speaking of "wholesale" and discounts. If you love shopping at wholesale prices and love charms and lockets jewelry (Valentine's is coming up :)), this is where I get my wholesale unique charms and adorable lockets jewelry. What Do You Look for in a Direct Selling Home-Based Business? It's not easy being the owners of a direct selling company especially if you're a brand new company. It takes capital, experience, and patience dealing with launching a new company but there's also no business quite like a direct selling business. Because it's multi-faceted, dealing not only with selling products, but also asking a sales force of independent consultants to recruit new people to the business. This involves managing not only product inventory, all aspects of operating a business, but on top of that making sure you have the experience to train a team of sales consultants. So how do you differentiate yourself from the pack? Here's what I look for in a direct selling home based business. I believe these along with outstanding products, savvy marketing, and plenty of capital can make or break a new, ground floor company. First on my list is quality of product and service. I know there are so many places to buy products that are commonly offered by consultants in direct selling companies but here's where a direct sales company can differentiate itself from regular retailers: offer exceptional and I mean go beyond the standard customer service protocol to attract and retain customers. There's nothing like lousy service! Field support and training for consultants which is so important if not one of the most important aspects of a direct selling business. The consultants are the first point of contact with a potential customer and future consultants. It's not enough relying on the top sponsors to train their teams because the company needs to have ongoing training offering the latest tips, tools, trainers, online and regional meetings if you want to grow a company on a national level. But more than the training itself is the support corporate offers to their consultants by staying connected with your consultants as much as possible with any news/updates. A weekly training brings consultants and corporate staff together as well as mass emails with announcements i.e. system glitches, out of stock inventory, and so forth. One of the things that make a direct selling business attractive is not only great products with a home based business but the camaraderie and belonging one feels when she is associated with a company that offers that personal connection and embrace consultants like an extended family unit. If you've ever been to those company conventions, they're so much fun aren't they?! When you represent a company that puts you first you can't help but return the love. The same goes for the person that helped you get started with your business. Your team mentor can have a big impact on your success. I believe that when you combine personal attention with outstanding support/training for your independent consultants along with great products, marketing, and plenty of capital ... who knows how big a company can grow. With these ingredients for success, the potential is unlimited. How about you? What do you look for in a direct selling home-based business? Would love to hear your comment below. Here in Southern California which typically enjoys warm weather pretty much year round, it has been cold lately! Winter is officially here. I've actually welcomed the occasional rain we've had and this cooler weather as it's a perfect time to wear my favorite boots and coats. What I don't welcome this time of year is the cold and flu season which is upon on. This latest article on Yahoo "Flu Reaches Epidemic Level" http://health.yahoo.net/news/s/nm/flu-reaches-epidemic-level-in-u-s-cdc-says can put quite a scare in us parents. And if you have kids, you know they somehow bring home the germs, no matter how many times they wash their hands. If you're a parent, what do you do in preventive care to safeguard your family during the cold/flu season? As a parent, I'm especially precautionary during this time of year. What I typically do is use preventive care, naturally. 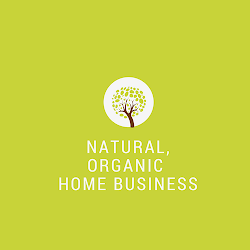 And this means being as natural and toxins-free in all areas of daily living as possible including using products with ingredients found in nature like essential oils. 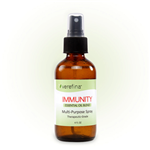 For example, I use this Multi-Spray Immunity Oil from Verefina packed with therapeutic-grade essentials oils such as clove bud, lemon, cinnamon bark, eucalyptus globulus, and rosemary to clean my kitchen counter, hard surfaces, as an air freshener, and even as a hand sanitizer instead of regular hand sanitizers which are filled with alcohol. I stopped using regular hand sanitizers because my nursing friends have encouraged me to ditch those anti-bacteria hand sanitizer and opt for washing your hands with soap and water, whenever possible. 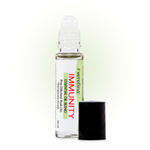 When I don't have access to soap and water, I also love the Immunity Oil Roll-On which is packed with therapeutic-grade pure essential oils to clean my hands. Verefina Immunity Roll-On 10 mil. Not to mention, the scent is wonderful, think being at the spa! It's so easy to use because it's small enough to fit in your purse and rolls on easily between your hands, you can apply to your pulse points, underneath your feet, chest, tummy, and so forth. I re-apply multiple times a day. It is my #1 go-to product to safeguard myself and my kids daily to keep the cold/flu away. And it's only $10 and lasts for a long time. For limited time only: Buy 2 and get 1 item FREE. Shipping is only $4.95. As always, every order gets *free* sample goody bag from me. There's an interesting article on Herbalife (a publicly traded network marketing company) and the network marketing industry in CNN Money. Critics argue that the business model is not sustainable because you're relying on friends to sell and recruit people and Herbalife is a pyramid scheme (which it is not). Here's the full article "The Money Behind Herbalife and Mary Kay"
This isn't the first time that network marketing or "multi level marketing" has been criticized for being a pyramid scheme. On the surface, it can appear that way for people who aren't in the business, and to be fair- there's no doubt there are shady practices by distributors/consultants but you can say that about any industry. There will always be a few bad apples. But the truth of direct sales/network marketing isn't the business model but the practices from its distributors i.e. recruiting, promises of making big money, etc. The business model is simple: the companies rely on consultants to sell products directly to people they know, bypassing traditional retail, and there's nothing illegal about this "direct selling" method. What's controversial with direct sales/network marketing is the business opportunity attached to it. In other businesses, you don't find sales rep selling products and recruiting people at the same time but this is common practice in direct sales/network marketing. The idea is leveraging your time and effort. Essentially, if you're a consultant and if you recruit people doing the same thing you've now doubled your selling efforts. In return, the company pays you a percentage of the sales from the people you sponsored to do the same thing. Here are some problems I have with the above mentioned article and critics. Sure, there's a cost involved because in order to be a consultant for the company, you need to purchase a start up kit. The start up can range from $59, $99, $149 and upward. But you get twice the amount of products for what you're paying into. And even if you decide not to pursue the business, the products are yours to keep. If you're paying $99 and getting over $250 worth of products that you might buy elsewhere- that's a bargain. It is true that there are additional costs. Some companies offer free replicated websites for consultants to sell products and some charge a monthly fee- anywhere from $9.95 to $14.95, depending on the company. This is the cost of doing business. If you were selling products on Etsy or Ebay, there are fees associated with being a seller. And if you were to open an ecommerce store on your own, you would need to pay for web hosting and other expenses. As for other fees involved such as mailing samples to customers, postage, catalogs, consultants do need to pay for these, but these are again, basic costs of doing business. For anyone who is in business understands that you can't open a business without incurring zero expenses. There's no doubt some consultants sponsoring people into the direct sales/network marketing business encourage new consultants to buy products but this is not required from the company. My direct sales company have never trained or encouraged consultants to buy inventory, use monetary incentives to recruit, or use practices that would compromise the integrity of doing business. Does this mean everybody adheres to these code of ethics? Of course not as it's impossible to streamline practices from thousands of consultants that work their businesses independently. It's not possible to keep track of how people operate their businesses on their own. #4 Can you make money? I know people who make six figure income in direct sales and people who don't make anything. There are also people who have fun with the business and only sell whenever they feel like it. And there are people who take this business seriously. Because direct sales is really a volunteer type of business, if you will, because you're not a paid employee- people can do whatever they want once they sign up to be consultants. Whether you can make money or not is only relative to what the consultant personally invests in terms of time in her/his business. It's a commission-based sales job. #5 Can you lose money? You can lose money in any business venture. The answer is yes but only if you buy products with little efforts in reselling or was somehow talked into buying products from the person that sponsored you into the business. A legitimate company will buy back a portion of your inventory. Your only obligation as a consultant is to purchase the start up kit, that's it. You're never required to buy additional inventory. It's always disheartening to read attacks on the direct sales/network marketing industry and as I said, there are shady people in this business, people who are not 100% upfront when they're recruiting people, especially newbies that are green and might not know all there is to know in this business, but most people I know in this business are awesome entrepreneurs that have experienced life changing benefits from this business, and operate their businesses with integrity. As with anything you do, always do a thorough research, and if you're hesitant about working with someone don't hesitate to find someone else. Would love to hear your take on the direct sales industry. This is the latest announcement from our corporate office that I am so excited to share with you! HAPPY NEW YEAR to our all our wonderful consultants!!! We are working hard behind the scenes at the Home Office to bring you some exciting things this year! Let's start the year off right with a few great promotions. For YOU: You’ve asked, you’ve begged, you’ve pleaded…and FINALLY…we LISTENED!!! There hasn’t been a hotter item than our coveted Verefina Logo Bag, and we are super excited to offer each of you a chance to earn one of your own! Our Verefina bag is our signature green color and has compartments to fit lots of pure, natural Verefina products. 1) Submit a minimum of $350 in commissionable sales during the month of January and receive a Verefina Logo Bag! 2) Reach higher by submitting over $500 in commissionable sales and receive a Verefina Logo Bag with over $150 in Verefina products inside! We’ve made it even easier to reach these sales goals by coupling this promotion with a fantastic, never-before-offered customer promotion! Announcing Buy Two, Get One Free Promotion! 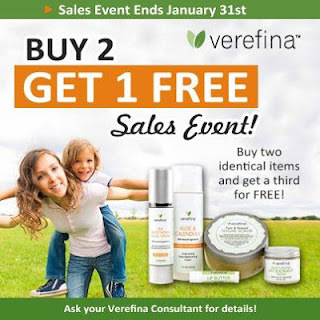 For you and your CUSTOMERS: Buy two identical products and get a third for FREE! This is a simple promotion that offers your customers amazing savings! 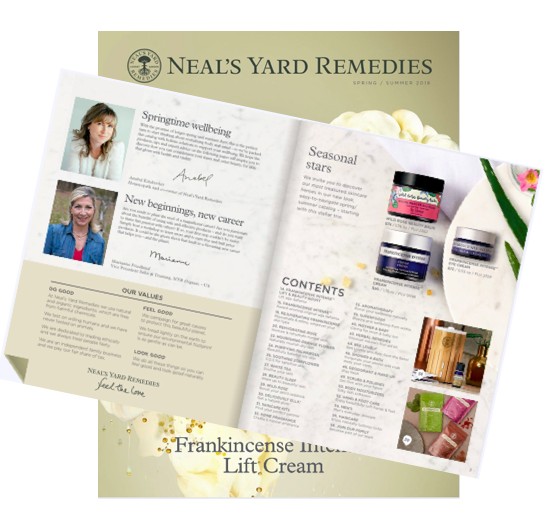 January is the perfect month to get your customers excited about our natural, healthy products, as many resolve to better their lives and become healthier at the start of a new year. · Both promotions run until 11:59 P.M. MST, January 31, 2013. · Buy two, get one free offer applies to single items only, not to any of our already discounted packages or diffuser. · Order two items of the same scent and we will give you the same scent for FREE. · As in past promotions, free items will NOT show in your shopping cart, but we promise they will ship! Wishing you a HEALTHY, Happy New Year! One of the most common questions I get asked when prospecting is "are there monthly sales quotas?" If I may be honest, it's something that I strongly consider when evaluating a direct selling business opportunity too. And the reason is that I want flexibility when it comes to the company's compensation plan. To be clear, there's a difference between monthly personal sales quotas and monthly sales quotas in order to earn from your team's sales efforts. You'll find many companies that may have no monthly sales quotas but every company requires you meet a certain monthly personal sales and/or team sales volume before you'll earn commission from your team sales. For example: company A could require something like this- $100 personal sales volume plus group volume of $1000 plus 1 recruit then you'll earn 5%. It's important to understand the differences because I've had friends that joined companies with a sponsor saying there are no monthly sales requirements however when they started growing a team and realized they needed at least $500 in personal sales to earn from their team, that was a surprise. As a rule, you should ask the right questions such as how you'll get paid before you join a company. Sometimes a sponsor won't tell you everything unless you ask specific questions so don't be shy about getting all your questions answered. Now that you know the difference between a monthly sales quotas, if there's any, versus the monthly requirement to earn a commission from your team, you might want to consider if partnering with a company with sales requirements is a good fit for you or not. I personally think some requirements are good and perhaps it could be quarterly as opposed to having zero monthly sales quotas and here's why- because it changes your mindset when you're required to produce monthly sales volume. Think of it as a sales job and by the way, direct sales is a sales job. You're an independent sales consultant and your income is 100% based on your personal sales and sponsoring efforts. If you were to work for a traditional company in sales, you're required to produce, there's no option. Similarly, if you're a consultant for a direct selling company and there's a monthly sales quotas of $100, $250, or whatever the amount may be, you'll have a different mindset. One that requires that you put in the consistent efforts to produce the sales volume required instead of partnering with a company that have no monthly sales requirements which definitely offers flexibility but this can also produce lack of results because there's no accountability. Of course, you can argue that if someone is motivated and understand what it takes to succeed in business, she will work in her business. This is ideal and it's every sponsor's dream to have someone with this mindset but the reality is that the majority of the people who join a direct selling business don't have this mindset, at least not consistent enough, that is. We can all be motivated once in a while, and sometimes, but all the time? That's a rarity. I know some days I'm not 100% motivated. And that's the reason sponsoring is equally important to a direct sales consultant's business as it is selling because it's a number's business. Most will fizzle out and if you continue sponsoring enough people into your business you'll have more opportunities to find and develop those superstars. And the best way to do this is perhaps partnering with a company that requires you to meet monthly sales goals. This will no doubt weed out non producers and most likely won't attract as many but as a team leader having monthly sales requirements is good for continuing to grow your team, sales, and a sense of everybody who is serious about growing a business is all working together in growing their businesses. You know the saying: when everyone's motivated and working together it's contagious to the rest of the team. What are your thoughts on the pros and cons of partnering with a company that requires sales quotas? I'd love to hear your thoughts and input.